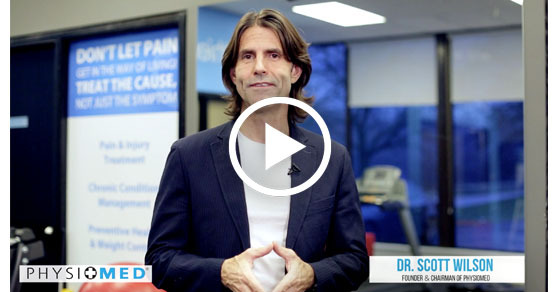 Hi, I'm Dr. Scott Wilson, founder and chairman of Physiomed, as we approach the holiday season and get ready for the end of yet another year, I'd like to take this opportunity to say a heartfelt thank you everyone who helped make this such a successful one for all of us at Physiomed and by everyone, I mean our many service partners hundreds of staff and practitioners working in our clinics and of course the more than 20,000 patients, who put their trust in us this year to help them get stronger, healthier, and more able to live life on their terms. You know when I look back at this year the one thing that I'm most proud of and what I think has had the greatest impact on the lives of our patients, is the way we've remained true to our philosophy and kept faith with our patients, our interdisciplinary approach features hundreds of practitioners from over a dozen disciplines, all working together to provide the best care and experience for our patients. We also focus on addressing causes not just the symptoms and we do this through our s model, symptoms, structure, strengthening and sustaining, as we look ahead to the new year I know that many of us are thinking about how we're going to be better next year, and for many people better includes getting healthier if that's your goal I'd like to leave you with a few things to think about today to help get you set up for success in the new year. Start now use moderation during the holidays and avoid the new year hangover. Get a health assessment baseline targets and avoid injuries. Set appropriate goals, realistic, specific and measurable. And finally listen to your body and do what feels good. By taking this approach and by getting started now before the new year at least in terms of planning you can create an even greater sense of motivation and commitment that can carry you through the holidays and ensure success in the new year. Thanks again to everyone for making this such a wonderful year and I wish you all a very happy healthy holiday season and all the very best for the new year.